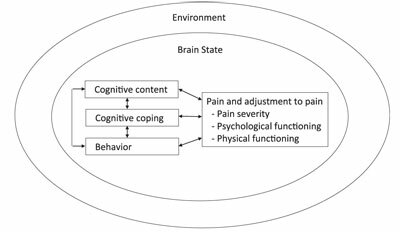 Professor Mark Jensen has published a review of psychological treatments for pain which organises different modalities into a framework. Currently, models which explain why one treatment works for pain do not necessarily help us to understand the mechanisms behind other pain treatments. The reason for creating an overall framework is to better understand how different treatments work, to understand why treatments work differently for different patients, and to understand how different treatments fit together. Behaviour - what patients do about their pain, or in response to their pain? Different treatments tend to target different components of the model. For instance, when a patient believes that movement will make their pain worse (maladaptive cognitive content) and decides to rest until the pain goes (maladaptive behaviour), then the therapist might decide to use psychoeducation about pain to alter the cognitive content, and encourage graded increases in movement (behavioural treatment). Alternatively, a therapist using hypnosis might create changes in the patient's brain state, and give suggestions for pain relief which affect how the patient feels about their pain (which would affect the cognitive coping dimension). One interesting aspect of the model is the comparison that is made between hypnosis and mindfulness meditation. These are often seen as quite separate treatments, with hypnotic treatments and suggestions aiming to modify cognitive content, whereas mindfulness is about non-judgementally accepting cognitions and experiences. However, Jensen argues that mindfulness can be seen as similar to the induction phase of hypnosis followed by suggestions for increases in acceptance. Similarly, relaxation can be viewed as an initial phase of hypnosis, leading to similar brain states, but absent the suggestion component. The upshot of the model is that it gives researchers a useful way to categorise psychosocial treatments for pain, and encourages clinicians to make sure they have more 'arrows to their bow' in order to be able to offer patients a full range of treatments to meet their needs.